I think everyone has had the experience of taking a bite of food that has transported them. That bite of food that takes them mind and soul back to their childhood or to a special place or to a fond memory. Food has that power. All food. Its part of its magic. I can’t eat prosciutto and melon (Recipe Card: PDF – 88kb) without thinking about The Pirates of Penzance, because my first time trying the delectable salty-sweet duo was while watching a movie adaptation of the play. I haven’t seen the movie since (about 20 years now), but I will almost universally be caught humming “Modern Major General” after eating prosciutto and melon. In the spirit of food’s nostalgic powers, I thought it would be fun to periodically share those recipes that are close to my heart. In some cases, I was able to lay my hands on the very recipe. In others, I have recreated recipes that never fail to invoke warm remembrances of bygone days. These are my memories, but I’d love to hear from you. What are your favorite nostalgic dishes? This entry was posted in From the Kitchen and tagged food, food remembered, melon, nostalgia, pirates of penzance, prosciutto, sense memory. Bookmark the permalink. This is a favorite of mine and is commonly found in France, Italy, Spain, and Argentina. 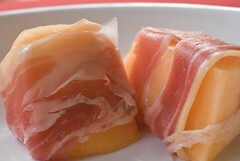 If you want the best experience use Pata Negra – the best cured ham in the world. German, were you able to find Pata Negra in St. Louis? I’d love to know where to get it. Mmmmm, the Russian version of “War and Peace” and Lamb and Apricot Stew. Mike, I couldn’t find it in St Louis but I ordered it from LaTienda.com – it is also called Jamón Iberica (http://www.tienda.com/reference/ibericoquest.html). Perhaps these days it can be found at Trader joe’s or Whole foods? In Vienna I was able to get it easily. Becareful with imposters or substandard versions. The meat should look dark and greasy when sliced thin at room temp (http://en.wikipedia.org/wiki/Pata_negra#Pata_negra see the last pic in the wiki). The best version I had was expensive, aged 36 months, but you could taste the walnuts in the meat. Unreal!